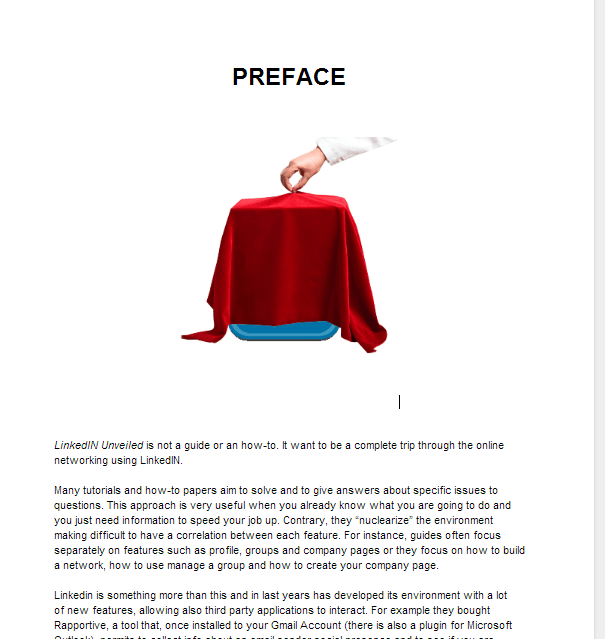 After my recent book, I’ve just started a new project that at the end will create an ebook aimed to give a new point of view about LinkedIN and the way you can use. In next days I will publish one by one each element in order to collect comments and suggestions that will be integrated into the final text. The work in progress and contributions will remain on-line as free access web book. The ebook will integrate contributions and will be in epub format in order to be readed on your mobile device. Here it is the preface as introduction of the project. Because English isn’t my mother language, I shall make some errors. So, feel free to suggest correction on comments. LinkedIN Unveiled is not a guide or an how-to. It want to be a complete trip through the online networking using LinkedIN. Many tutorials and how-to papers aim to solve and to give answers about specific issues to questions. This approach is very useful when you already know what you are going to do and you just need information to speed your job up. Contrary, they “nuclearize” the environment making difficult to have a correlation between each feature. For instance, guides often focus separately on features such as profile, groups and company pages or they focus on how to build a network, how to use manage a group and how to create your company page. Linkedin is something more than this and in last years has developed its environment with a lot of new features, allowing also third party applications to interact. For example they bought Rapportive, a tool that, once installed to your Gmail Account (there is also a plugin for Microsoft Outlook), permits to collect info about an email sender social presence and to see if you are connect each other. More, you can keep track of the conversations with your network directly within the linkedin contact management system. Proinsight is a third party mobile app that offer you insights about your linkedin network and CanWeConnet for your Apple or Android device can help you to discover potential new contacts according to your profile and location. These LinkedIN related stuffs can be an important tools for your online networking. In this work I want also offer the knowledge base to understand how informations collected and action taked can influence the networking activity. So, in addition to single feature or app, I want to make you understand how to integrate them to your networking strategy. For this reason I tried to mix the operational (how-to) approach to a strategic one and I structured the chapters with “when to use”, “why this matter” and a lot of “contextual definitions”. Finally, because this ebook want to have a practical approach I designed the content in how-to-Q&A format. The questions are related to keywords used to reach my 2011 LinkedIN Guide I published (in Italian) into my blog (https://www.simonefavaro.it/guida-a-linkedin/). This project is open and all contributions are allowed. Each chapter will be posted on my blog and collected under the LinkedIN Unveiled page and structured as an online book.